Gives the nails a healthy look with less effort. 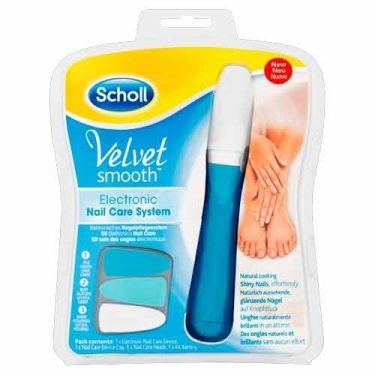 DESCRIPTION: Velvet Smooth Electronic Nail Care System from Dr. Scholl is an electronic file suitable for filing, polishing and shine nails. With the Scholl Velvet Smooth electronic nail care system for nails and toe WOW. Contains three different heads to file, polish and polish. The electronic nail care system allows you to take care of your fingernails and toenails with a simple push of a button, leaving your nails bright and natural. The double-speed oscillating insert helps provide natural-looking shiny nails in just three steps. Polish the nail to brighten the third file.